Burlingame, Michael, The Inner World of Abraham Lincoln,, (University of Illinois Press, 1994). Donald, David, "We Are Lincoln Men": Abraham Lincoln and His Friends, (Simon and Schuster, 2003). Guezlo, Allen C., Abraham Lincoln: Redeemer President, (Erdmans, 1999). “Lincoln was a curious – mysterious – quite an incomprehensible man,” wrote William H. Herndon shortly before he died. As Lincoln’s longtime law partner and longtime wannabe biographer, Herndon knew whereof he spoke. In this book, writer Joshua Wolf Shenk uses Herndon and others to try to explicate one of the most inexplicable parts of Lincoln’s character – his melancholy and occasional deep depressions. Lincoln’s emotional life has long been shrouded in mystery. Even for those who regularly observed and interacted with him, Abraham Lincoln remained an enigma. Sometimes, a impenetrable fog seemed to settle around him that even close friends could not penetrate. At other times – such as after the death of friend Anne Rutledge in 1835 or the “Fatal First” of January 1841, Lincoln sunk into a deep depression which deeply worried his friends and led in 1841 to aggressive medical treatment which probably made him worse. 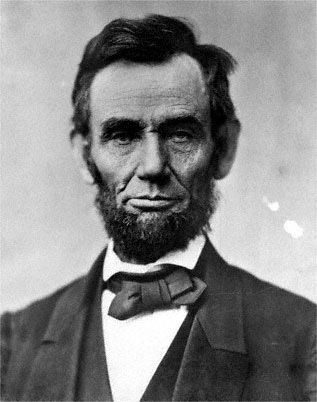 “Lincoln’s melancholy never failed to impress any man who ever saw or knew him. The perpetual look of sadness was his most prominent feature,” wrote William H. Herndon in his biography of his law partner.4 Shenk’s book examines both Lincoln’s predilection to melancholy and his reliance on humor to offset that mood. Lincoln’s dissatisfaction with the state of things was further reflected several years later when as a Congressman, he wrote his wife: “In this troublesome world, we are never quite satisfied.”8 Dissatisfaction drove him out of politics a year later and in 1854, dissatisfaction with politics drove him back into the political world. Misery seems to drive him – to either withdraw from the world or to enter back in. Melancholy was an obstacle to Lincoln’s success, but it was also a building block for it. Shenk is a writer whose work on Abraham Lincoln has appeared in, the American Prospect, the Atlantic Monthly, the New Yorker, and TIME. Allen C. Guelzo, Abraham Lincoln: Redeemer President, p. 164. Michael Burlingame, editor, An Oral History of Abraham Lincoln, John G. Nicolay’s Interviews and Essays, p. 2 (Conversation with Orville H. Browning, June 17, 1875). Roy P. Basler, editor, The Collected Works of Abraham Lincoln, Volume I, p. 229 (Letter from Abraham Lincoln to John Todd Stuart, January 23, 1841). William H. Herndon and Jesse W. Weik, Herndon’s Life of Lincoln, p. 480. Joshua Wolf Shenk, Lincoln’s Melancholy: How Depression Challenged a President and Fueled His Greatness, p. 212. Roy P. Basler, editor, The Collected Works of Abraham Lincoln, Volume I, p. 229 (Letter from Abraham Lincoln to Joshua F. Speed, February 25, 1842). Joshua Wolf Shenk, Lincoln’s Melancholy: How Depression Challenged a President and Fueled His Greatness, pp. 94. Roy P. Basler, editor, The Collected Works of Abraham Lincoln, Volume I, p. 229 (Letter from Abraham Lincoln to Mary Todd Lincoln, April 16,, 1849). Gabor Boritt, editor, The Lincoln Enigma, p. 33 (Douglas L. Wilson, “Young Man Lincoln”). Joshua Wolf Shenk, Lincoln’s Melancholy: How Depression Challenged a President and Fueled His Greatness, pp. 213-215. Doris Kearns Goodwin, Team of Rivals: The Political Genius of Abraham Lincoln, p. xvii. Michael Burlingame, editor, An Oral History of Abraham Lincoln, John G. Nicolay’s Interviews and Essays, pp. 2-3 (Conversation with Orville H. Browning, June 17, 1875). Joshua Wolf Shenk, Lincoln’s Melancholy: How Depression Challenged a President and Fueled His Greatness, p. 214. Roy P. Basler, editor, The Collected Works of Abraham Lincoln, Volume I, p. 229 (Letter from Abraham Lincoln to Fanny McCullough, December 23, 1862). Joshua Wolf Shenk, Lincoln’s Melancholy: How Depression Challenged a President and Fueled His Greatness, p. 215. Joshua Wolf Shenk, Lincoln’s Melancholy: How Depression Challenged a President and Fueled His Greatness, p. 156. Joshua Wolf Shenk, Lincoln’s Melancholy: How Depression Challenged a President and Fueled His Greatness, p. 189.